Brazilian Blowout Blog: Goodbye Summer, Hello Fall. Summer temperatures are starting to simmer down and cooler weather is on the horizon. While a drop in temp might be just what the doctor ordered, the change in climate could mean stressed out strands! That’s why now is the perfect time to book a Brazilian Blowout! Summertime means ponytails, beachy hair and braids – and while these looks are stylish, they can wreak havoc on hair. 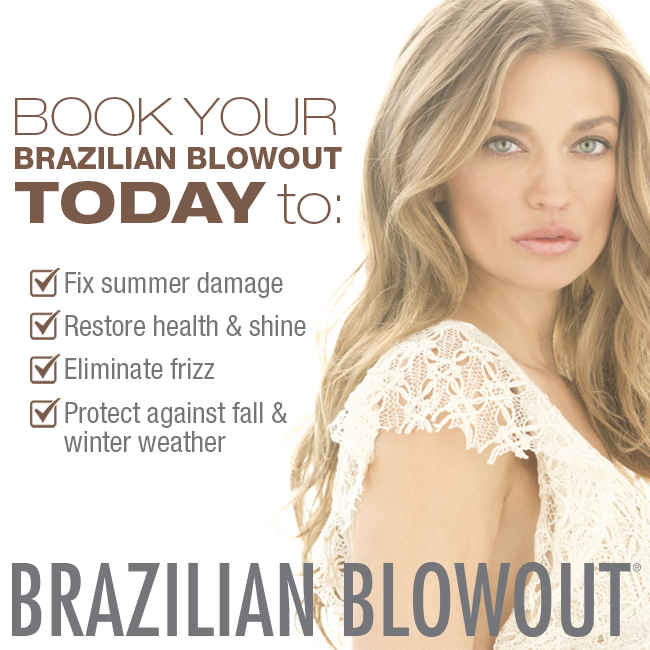 A BrazilianBlowout will help mend summer damage while it will restore the health and shine of your hair. Through the use of innovative and breakthrough bonding technologies, the Brazilian Blowout smoothing treatment actually improves the health and condition of the hair by creating a protective protein layer around the hair shaft to eliminate frizz and smooth the cuticle. This means you can confidently wear your hair down all season long with very minimal styling effort. The best part of booking your Brazilian Blowout now? Not only will your hair be healthy, shiny, frizz-free and radiant, you will actually protect your tresses against harsh fall and winter weather! Cold air, rain and snow will be no match for your hair. So what are you waiting for? Book your Brazilian Blowout appointment with a certified stylist today and start enjoying the best hair of your life NOW! In many parts of the United States, trees show up ablaze as their leaves turn splendid shades of gold, orange and red. From the Pacific Northwest to New England to the Mid-Atlantic and Appalachian states - the pre-winter leaf-changing view is stunning. In reality, there are benefits to be made in this industry. In any case, you'll need to ensure you know your state's laws and directions when you anticipate beginning a business that influences auto to title credits. Hello! This article very interesting, thanks a lot! Cheak please also my similar blog! More interesting info only here! And also you can check more information about whatsapp web hack! Just try it now! Works awesome, I lost all my hair due to chemo and once I finished my treatments I started using this wonderful product you should try this!!! It really does grow fast, I just recommend every other day and you will a difference within a week! Would recommend to all…. Is the money a need or for something additional? In the event that you've never acquired a payday advance, search around before picking an organization. Think about the diverse rates and their alternatives and check whether you're happy with the client benefit they give you. Say hello to the new school year. You should remember all that things you have learned before. read this page for more.